Normal Battle Stage – Normal Battles are battles with regular creeps and creatures. Enemies here can go from mediocre to average which most players would use to charge up their noble phantasm gauge. Using these stages to charge up your Noble Phantasm will definitely aid you in the long run especially when battling in the harder stages. Fatal Battle Stage – The Fatal Battle Stage is often times the last stage for a battle. However, there’s a particular twist: some of the enemies here have gauges similarly to servants except its turn-based. Depending on the class, enemies can use their special skills in varying rates. Enemies that fall under the Fatal Battle stage include Shadow Servants, Servants themselves, and special creatures. Grand Battle Stage – The Grand Battle often involves one grand enemy with unique properties. When in a Grand Battle, these often don’t have any waves before them making it hard to charge up a Noble Phantasm. 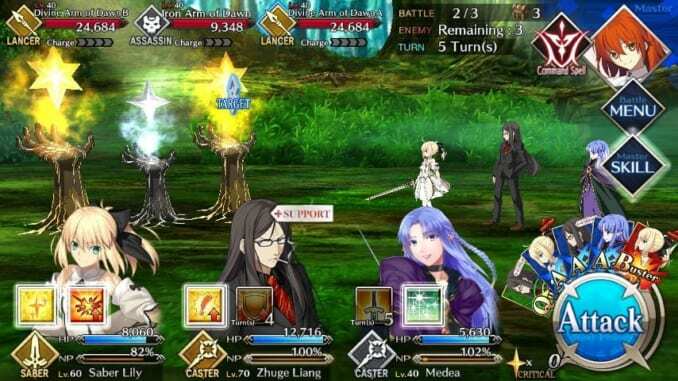 However, should players use a Starting NP Craft Essence, it may ease the battle along as players will have an easier time activating their Noble Phantasm. Before battle, players will enter the support page where they can choose a support servant to help them. After selecting a servant to help them, they can edit their other servants to best suit their needs in combat. Once that’s done, players will then begin the battle. Before each fight, players can take their time preparing for battle. On the battle screen, you can see the enemies on the left and your own Servants on the right. The enemy information is located on top of the screen, and the information for your Servants are on the bottom. 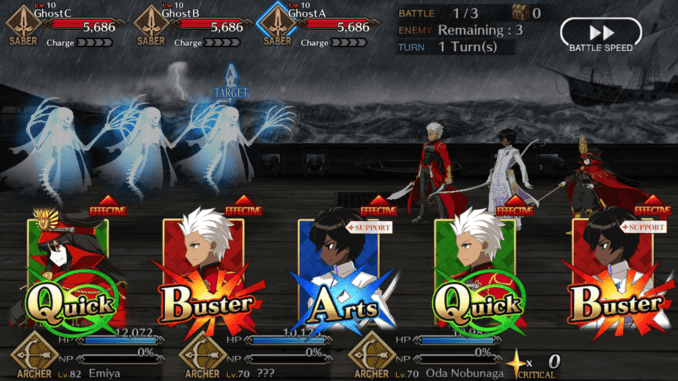 Below the HP bars are the Charge Gauges for the enemies, and the NP gauges for your Servants. The two gauges are similar in function, but different in form. Charge Gauges go up one bar per enemy turn, while the NP Gauge goes up by percentage, depending on your actions. You can tap the respective Servants’ portraits for more information. The pop-up window will give details on that Servant’s Noble Phantasm, as well as any status effects inflicted on them and their duration. To win, make sure you watch your enemies’ movements during the battle. The boxes on top of your Servants’ HP and NP bars will show their skills. Tapping these will activate the skill, after which they shall be greyed out until their cooldowns finish and they become available again. Remember to activate the desired skills before pressing the Attack button, because they cannot be activated during the Command Phase. On the right side of the screen, you can see the number of Command Spells available right beside your character portrait. The first button below the portrait is the game Menu. The second button is the Master Skills, which are dependent on the Mystic Codes worn by the Master. See below for more information on these support skills. Once you press the Attack button, the Command Phase begins. You cannot return to the Battle Preparation screen once you have pressed Attack. Players draw five random command cards per turn. At the beginning of the Command Phase, Critical Stars are also randomly distributed among the five command cards. The kinds of cards available will depend on the three Servants you have chosen for battle. From here, you can choose three from the five cards. The selection here is very important, because these will determine the Command Card Chains that you can activate. If a character’s NP gauge is full, there will be an extra card for their Noble Phantasm. You can deselect the cards. But once you have clicked the third card, the servants will immediately begin their attack. So, be careful. See the table below for the possible Command Card Chains. Buster Chain 3 Buster Cards Increases base attack by +20% for all attacking servants. Quick Chain 3 Quick Cards +10 Critical Stars to C. Star Pool. Arts Chain 3 Arts Cards +20% NP Gauge for all attacking servants. Buster Brave Chain 3 Buster Cards, 1 Servant +20% Damage plus Extra Attack for 1 servant. Arts Brave Chain 3 Arts Card, 1 Servant +20% NP Gauge plus Extra Attack for 1 servant. Quick Brave Chain 3 Quick Cards, 1 Servant +10 Critical Stars. The first card selected will also have additional effects depending on their type. Arts cards: +100% NP generation. Quick cards: +20% critical stars generation. Once you finish selected the cards, the attacks will be executed. FGO has a feature called Overkill, where a Servant can keep attacking an enemy whose HP has already reached 0. 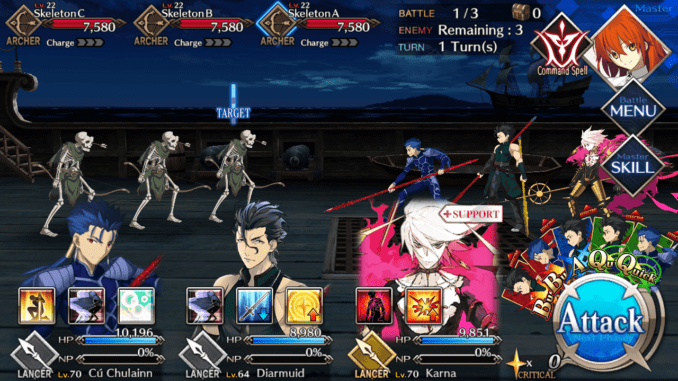 Overkilling gives additional NP and critical stars, but they can only be performed if it’s the same Servant executing the attack on the same defeated enemy. On the other hand, Critical Stars allow for critical hits, which double the damage dealt and any bonuses that come with the attacks. After all attacks have been executed, the game will either move on to the next round, or the battle will be won. The game returns to the last Battle Preparations screen if ever the game is connected or shut down in the middle of a battle. There are three primary characteristics of Noble Phantasms to take note of: their Rank, Level, and Type. While levels increase via fusing two of the same servant, ranks increase through interlude quests. Types, meanwhile, affect the type of Command Card that the Noble Phantasm performs as. Noble Phantasms normally have two effects: a Primary Effect and a Secondary Effect. Primary Effects are boosted by the level and rank of the Noble Phantasm, while Secondary Effects are boosted by the amount of NP Gauge used up. When multiple Noble Phantasms are used in the same turn, the later Noble Phantasms are Overcharged. The NP gauge is increased by 100% per Noble Phantasm used before it, up to a maximum of 500%. Overcharging directly boosts the Secondary Effects, but not the Primary Effects, so keep this in mind when planning your Noble Phantasm activation. Depending on their Servant class, they can deal more or less damage to the enemies. 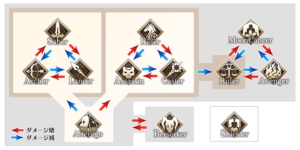 The flowchart below gives a guide on how the damage differs between Servants. Red arrows mean they deal more damage (1.5x) to that class, and blue arrows mean they do less damage (0.5x). Berserkers deal increased damage (1.5x) to all classes except Shielder, but they take double damage (2.0x) from all classes, as well. Shielder is a special class that does not take bonus damage from any class, but does not deal bonus damage to any class, either. Ruler is another special class that takes half damage (0.5x) from six of the main classes (Saber, Archer, Lancer, Rider, Assassin, and Caster). Masters pitch in to support their Servants from time to time. Before entering battle, players can choose what Mystic Codes to use. These mystic codes can heavily affect a player’s gameplay through battle. Along with Mystic Codes, they also have Command Seals which can pull them out of sticky situations. Masters have access to up to three Command Spells at a time. These spells are incredibly powerful, and can turn the tides of battle. However, Masters recover only one Command Spell a day, so be careful when just using them. It’s best to save them for the toughest battles, especially for limited-time events. 1 Fully heals one Servant’s HP. 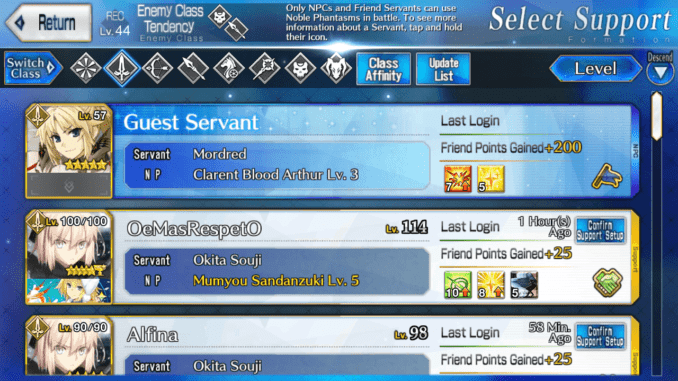 1 Charges one Servant’s NP Gauge to 100%. Masters can equip Mystic Codes, which change both their outfits and Master Skills available in battle. Each Mystic Code provides a set of three Master Skills, so choose the best ones to support your team of Servants. Players can earn Mystic Codes from events or finishing certain singularities. Is there a bonus for chaining NPs? Thank you! I have been puzzled by how sometimes my NP goes to 200% or 300% overcharge when there is no overcharge from battle. So NP chain bonus is why. Another question please. Do NP with a buster card cover receive damage bonus from Buster Chain?